Plant two feet apart. Slow to establish but long-lived and large once established. Beautiful - my favorite! 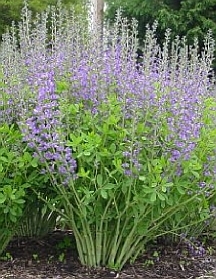 False Indigo grows 3 to 4 feet tall and forms a large bushy plant with attractive clover-like foliage. From late spring to midsummer it sends out 9 to 12 inch spikes of blue flowers. It is a hardy, drought tolerant, native species that is long lived and a good performer in Minnesota. It will grow in almost any soil in full sun or very light shade. The plants are rather slow to take off at first and flowering will not occur until the second or third year. Patience will pay off. False Indigo is a good choice for the back of the border. It also does well in naturalized situations and on slopes. Removing flowers before seed pods form will prolong blooming. False Indigos are very difficult to divide because of the deep tap root. They are best left undisturbed. If new plants are desired, they can be started from collected seeds which will come quite true.